A Remote Chinese Province Uses Its Climate To Grow A Big-Data Industry : All Tech Considered Southwest China's Guizhou province is one of the country's poorest, most remote regions. But Guizhou has some unique advantages, which it is trying to use to transform itself into a big-data hub. Visitors look at a booth explaining the Chinese government's plans for the big-data industry at an expo in southwest China's Guizhou province. Today, Guizhou's economy ranks 25th out of 31 Chinese provinces. Jagged karst peaks make the landscape difficult to navigate and cultivate. It is home to a disproportionate number of China's roughly 60 million "left-behind children," whose parents have sought work in the cities, leaving them in the care of relatives. But the province is pursuing an ambitious strategy to surge to the forefront of China's high-tech sector. It has picked big data as the industry that will make the most of its natural advantages. Guizhou's story illustrates how China simultaneously inhabits multiple developmental eras. While parts of Guizhou remain mired in the pre-industrial stage, others are edging into the space age. It also illustrates how China is trying to upgrade its industries, from labor-intensive factories making goods for export, to cleaner and more capital-intensive high-tech and service companies. For each of the past three years, Guizhou has put on a big international expo to highlight its new role as a big data hub. Dell, Qualcomm and other tech firms have booths here. 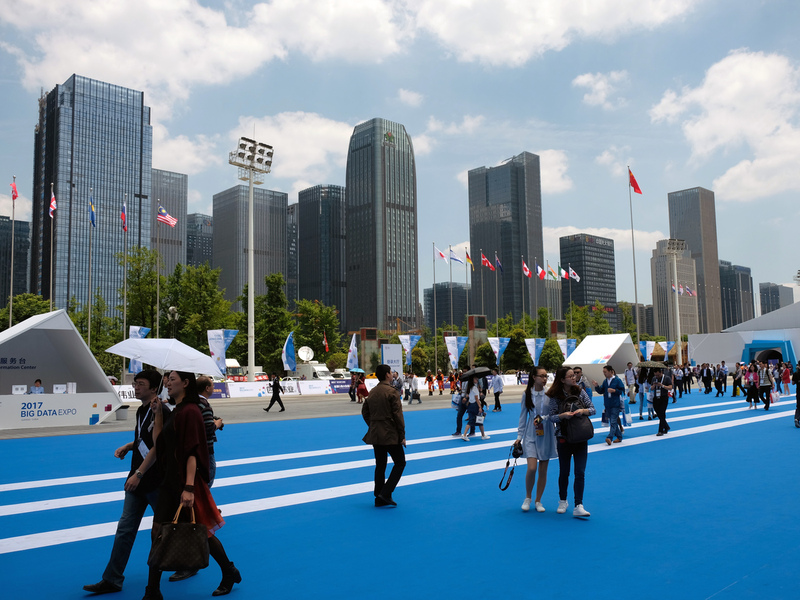 In just about a decade, the provincial capital of Guiyang has taken a cluster of suburban hill towns and converted them into a new urban district, bristling with skyscrapers that surround the convention center where the expo is held. 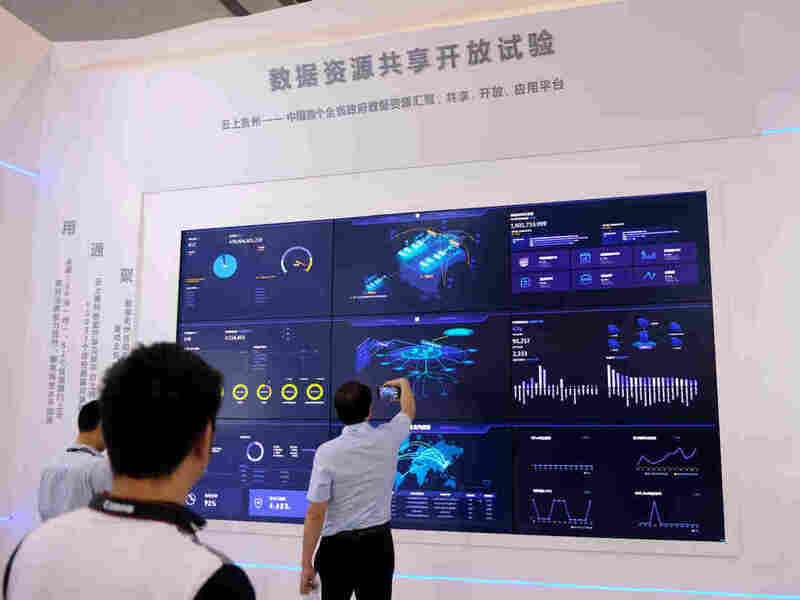 A new urban district and an annual big-data expo have arisen in recent years as the centerpiece of the high-tech industry in Guiyang, capital of Guizhou province. Guizhou has broken out of its isolation by building high-speed railways, bridges, tunnels and added international flights to link it to domestic and foreign cities. China's state-owned telecom firms have integrated it into the backbone of China's Internet infrastructure. The central government has offered a raft of incentives to attract big-data firms, establishing experimental zones and pilot programs, and giving discounts on electricity from the province's plentiful supply of hydropower. Taiwanese electronics maker Foxconn, which makes iPhones, Kindles, PlayStations and other gadgets in China, has set up a factory and data center in an industrial zone an hour's drive from the provincial capital. "We got our start in manufacturing, but we're actually transforming ourselves into a service company," explains Ray Chan, who has designed Foxconn's data centers in China. Like many companies in China, Foxconn is trying to make its manufacturing operations more efficient, through the use of cloud computing, networked machines and eventually, artificial intelligence. All of this requires analyzing huge amounts of data, and storing it on servers. Chan designed Foxconn's data center to sit on a natural plateau, where the altitude and monsoon climate keep the average annual temperature at 59 degrees. 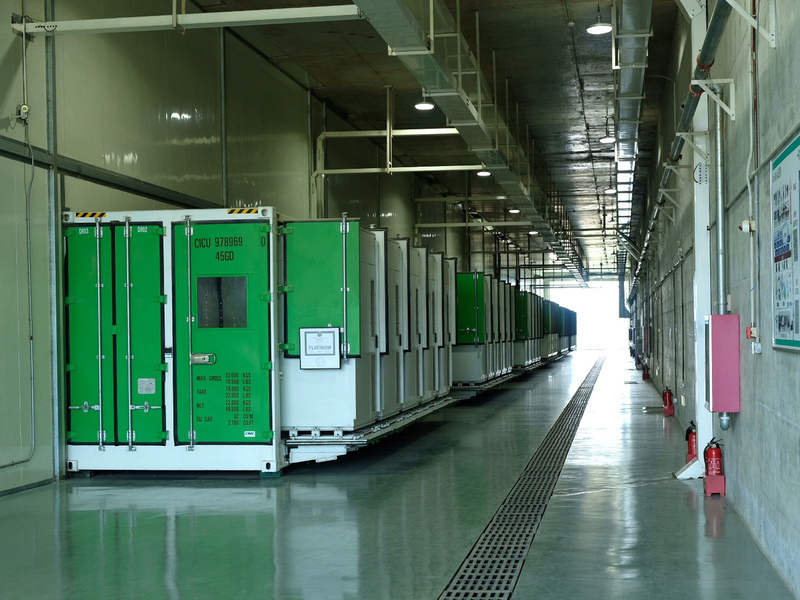 Chan designed a natural wind tunnel, wedged between two mountains, so that the 6,000 data servers installed there receive free, natural cooling. 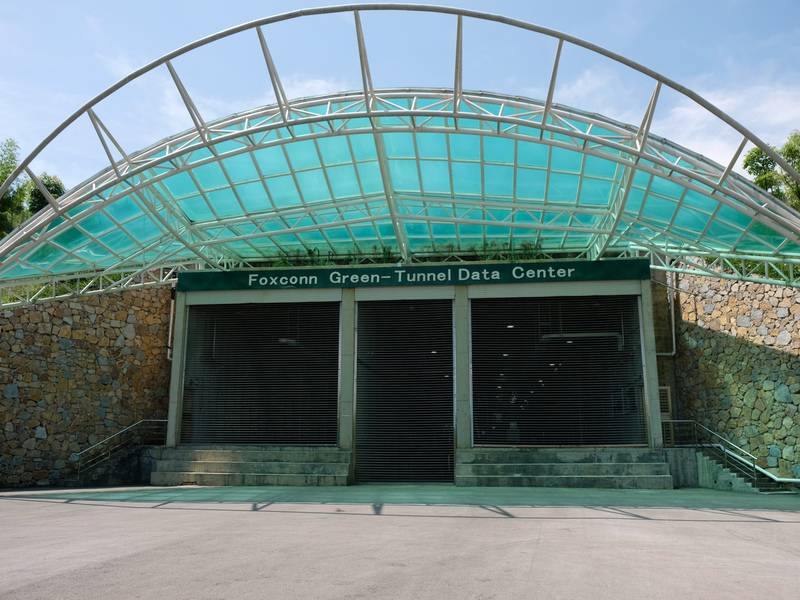 Servers store data at a center built by Taiwanese electronics manufacturer Foxconn. The design of the center, between two mountains, provides enough wind to cool the servers. Companies in Guizhou are not just collecting big data on businesses. They're collecting it on people, in order to improve urban services and education. At the big data expo, Xia Yiping, co-founder of the bike-sharing firm Mobike, gives a presentation on how big data allows his company to augment and integrate with Chinese cities' urban transport systems. Riders use a smartphone app to locate and unlock their bikes, which are equipped with tracking devices. Xia says all this generates a lot of useful data. "We use this data to improve our product experience," Xia says. "And secondly we use the data to dispatch, redistribute the bicycles based on the [users'] requirements." This helps commuters get to destinations not served by bus and subway lines, Xia adds, while reducing millions of tons of carbon emissions each year. Xia notes, however, that he fields a lot of requests from Chinese government agencies for his data, and these agencies have different security standards, which could lead to the loss of data. Xia says the agencies are asking for riders' routes, in order to improve city planning, and not asking for personal information. The Foxconn data center was designed to sit on a natural plateau, where the altitude and monsoon climate keep the average annual temperature at 59 degrees. But some privacy advocates are concerned that the rise of big data could empower Big Brother. When asked if he's concerned about increasing government surveillance of citizens, Xia says the government is "drafting a lot of legislation around that, to protect private information." Last month, China's new cybersecurity law came into effect. It bans companies from selling users' personal data to third parties. It also gives broad powers to China's cyber administration to control domestic Internet activity, which has triggered criticism from international human rights groups. Some cities, such as Shanghai, plan to use big data to establish voluntary "public credit rating" systems to promote or discourage certain kinds of behavior. In Guizhou, state media report, some local governments intend to put tracking devices on "left-behind children," and use the big data for "monitoring their security." "The development of big data is an era, an historical trend," says Chen Gang, the Communist Party secretary of the provincial capital, Guiyang, speaking to reporters during the big data expo. Thanks to big data, he asserts, Guizhou's air is cleaner, "our city is more orderly, and our society more civilized." And with the help of abundant surveillance cameras on the city's streets, he adds, "we've protected the good guys, and punished the criminal elements." Chen points out that Guizhou has received important political support from none other than President Xi Jinping, who will preside over a national Communist Party congress this fall as a Guizhou delegate. The meeting is expected to approve a second five-year term for him as head of the party. Xi Jinping "has always been worried about our poor," Chen says, "and he uses this method to express his hope that Guizhou can accelerate its development, while protecting its environment." Chen's star seems to be rising as well. Not long after the big-data expo, state media reported that Chen was appointed party boss of a new, special economic zone near the capital, which Xi Jinping has made one of his signature domestic policies.